The trip is as advertised. The boat was comfortable, the were 17 guests on this trip. The food and open bar was available the entire trip. They take 6 out on the skiff at a time to swim with the sea-lions. This mini excursion is about 40 minutes per small group. Wish there was enough snorkel gear to swim at the private beach while the mini-excursions were going on. We spent 5 hours on the boat. Plan in 2 hours each way to La Paz. In total our trip was over 10 hours. We were picked up and dropped off at our hotel near San Jose Los Cabos. 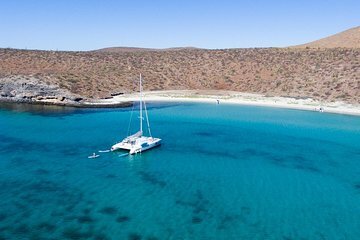 This tour was as advertised - I loved the privacy of the boat, the unlimited drinks and food, the quality of the boat and the service!The operator was even kind enough to pick us up in todos Santos! I only will say that viator tour is slightly confusing as I thought I booked espiritu but I didn't.